Census Overseers Seeded DOJ's Request To Add Citizenship Question, Memo Shows Dozens of states and cities are suing for the removal of the question, which the agency's own research suggests will suppress participation and make the 2020 census less accurate. 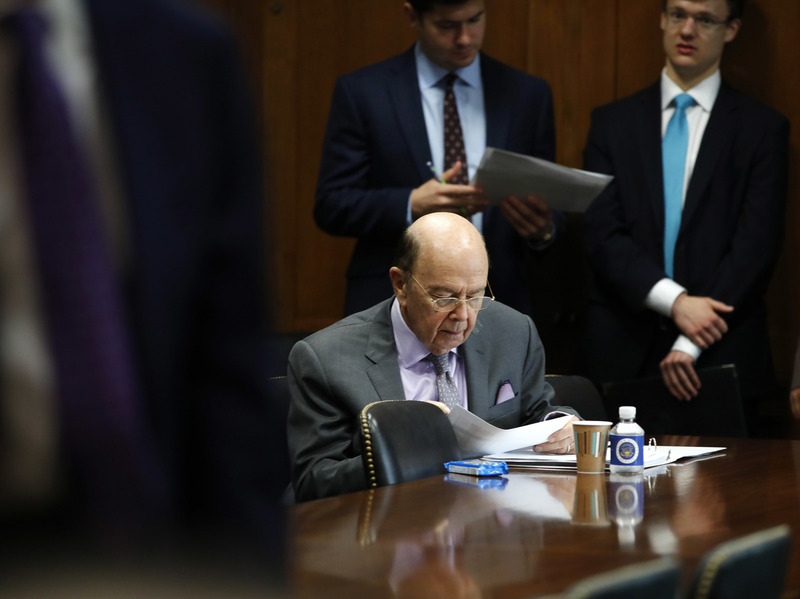 Commerce Secretary Wilbur Ross prepares ahead of a Senate hearing on tariffs on June 20, in Washington, D.C. 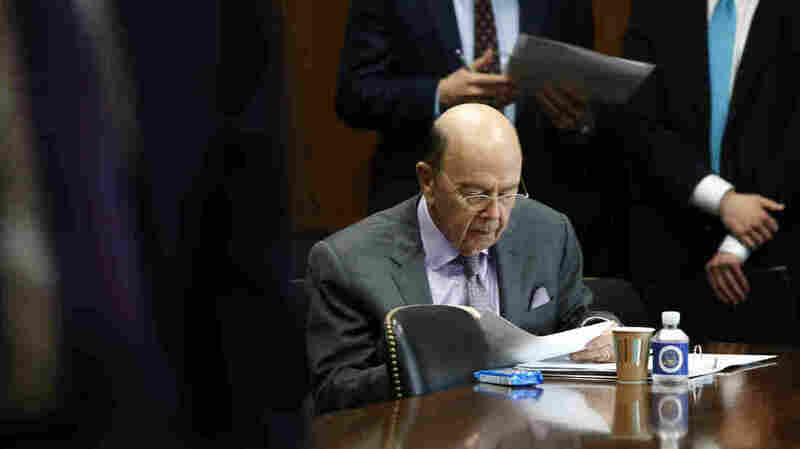 Months before he was asked to review a Justice Department request for a citizenship question to be added to the 2020 census, Commerce Secretary Wilbur Ross already had concluded that including one "could be warranted." In fact, Ross and his staff asked the Justice Department to submit the formal request for the controversial question, according to a newly released memo written by the Commerce secretary. The memo contradicts Ross' testimony during the House Ways and Means Committee's March 22 hearing, when the Commerce secretary told Democratic Rep. Judy Chu of California that the Justice Department "initiated the request" for a citizenship question. This document reveals Ross was involved in discussions about a citizenship question in the early months of the Trump administration. After Ross was appointed to head the Commerce Department, he and his staff asked the DOJ whether it "would support, and if so would request, inclusion of a citizenship question as consistent with and useful for enforcement of the Voting Rights Act," according to the memo. Ross — who oversees the Census Bureau and has the discretionary authority to add questions to census forms that federal law requires all U.S. households to complete — announced his approval of the controversial citizenship question in March. His decision came after the Justice Department submitted a formal request for the question — as Ross had asked — to the Census Bureau in December 2017. In the new memo, Ross wrote that he began considering adding a citizenship question "soon after" he was confirmed as Commerce secretary in February 2017. "My staff and I thought reinstating a citizenship question could be warranted," he said, noting that the issue was raised by other "senior" Trump administration officials. Ross and other Trump administration officials have said the driving force to add the question is a need for a better count of voting-age citizens to enforce the Voting Rights Act, which has relied on citizenship estimates ever since the law was enacted in 1965. Ross' memo raises questions about what else may have motivated the administration to push for the question, which the Census Bureau's chief scientist, John Abowd, warned would be costly, harmful to the accuracy of the 2020 census and generate "substantially less accurate" citizenship status data than those available in existing government records. Ross' memo was filed in federal courts Thursday by the Justice Department as part of the lawsuits over the citizenship question. More than two dozen states and cities are suing for the removal of the question, which Census Bureau's own research suggests could discourage noncitizens from taking part in the next once-a-decade head count of every person in the U.S., required in 2020 by the Constitution. The last time the bureau asked all U.S. households about citizenship was in 1950. In Commerce Department emails filed in federal courts earlier this month, Kansas Secretary of State Kris Kobach, who once helped lead President Trump's now-defunct voter fraud commission, wrote that he spoke with Ross about the then lack of census citizenship question in 2017 "at the direction of Steve Bannon," the former chief White House strategist. The Voting Rights Act was not mentioned in Kobach's July 2017 emails to Ross and his staff. Instead, Kobach wrote about his concern that "aliens who do not actually 'reside' in the United States are still counted" in census numbers used to determine how congressional seats distributed among the states. Neither Kobach nor Bannon have responded to NPR's requests for comment. The Commerce Department previously has avoided providing details about Ross' communication with Kobach. In an email, a spokesperson wrote, "The notion that Secretary Ross decided to reinstate the citizenship question in response to a single email is clearly disproved by the robust administrative record" of documents submitted for the lawsuits over the citizenship question. The Commerce Department spokesperson has also avoided answering NPR's inquiries about Ross' March 22 testimony to members of Congress, the Trump administration officials Ross referred to in his memo, and why Ross thought a citizenship question "could be warranted." "In the interest of transparency and expeditious resolution of frivolous litigation, Secretary Ross filed a supplemental memorandum [Thursday] clarifying the circumstances leading up to DOJ's December 2017 request to reinstate a citizenship question on the 2020 decennial census," the spokesperson wrote in an email. Attorneys for the plaintiffs in the citizenship question lawsuits, however, are calling for the Trump administration to release additional documents as part of the courts' review of whether Ross' approval of the question was politically motivated.